A film screening and Q&A will be held on Friday, Dec. 7, at 8 p.m. in the Japanese American National Museum’s Tateuchi Democracy Forum, 111 N. Central Ave. in Little Tokyo. In “Strangers,” a late-night contract murder, carried out with methodical ferocity, is followed by a kidnapping, and these violent but silently accomplished acts set the tone for an atmospheric L.A. noir. Writer/director/lead actor Michael Aki’s vision of the city is one of constricted spaces and eerily underpopulated streets, where his taciturn killer plies his trade as a solitary loner. The dead man’s girlfriend (Hong Kong Film Award winner Eugenia Yuan) turns out to be the hitman’s next assignment, but an unfamiliar longing for connection stays his hand, and the two embark on an odd-couple odyssey that by necessity evolves into a getaway. 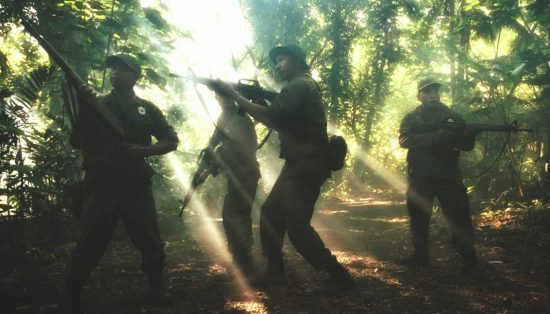 Preceding “Strangers” is Brian L. Tan’s 30-minute film “Holdout,” a historical action drama based on the true story of the last Japanese holdout from World War II. Left behind on an island by his unit, he never learned of Japan’s defeat. Suddenly, his worldview is challenged when he encounters a modern American tourist. These screenings are presented by Chopso, a streaming service for Asian- and Asian American-made content. Make sure to stay after the show for a Q&A with Aki, Yuan and Tan. An after party will be held from 10 p.m. around the corner at Far Bar, 347 E. First St. This program is free, but RSVPs are recommended using this link. For more information on events at the museum, visit www.janm.org.